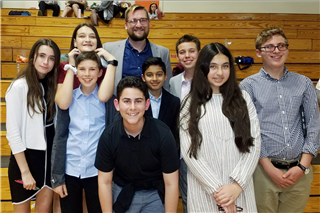 On March 16, Windward's Middle School and Upper School Debate teams each competed in area debate tournaments. Our Middle Schoolers presented their arguments at the Polytechnic Quad League tournament, debating the topics of genetically engineered foods and paid family leave policy. Student representatives included Jackson Walter '24, Jet Jadeja '24, Misha Sharif '24, Ben Mayer '24, Tessa Weiss '23, Amanda Solomon '23, Abe Ezra '24, and Jack Samet '23. The tournament netted a number of group and individual achievements. Out of 22 schools and over 110 teams, Windward placed Third overall, with two teams finishing with 3-1 records. Ben, Amanda, and Tessa took 22nd, while Abe and Jack placed 25th. Finally, out of over 300 students, Ben took home Fourth Place speaker! On the Upper School front, Ben Pearson '19 and Alonzo Meallet '20 competed in the state qualifying tournament at Brentwood school. They debated six rounds on topics ranging from policies regarding autonomous vehicles, presidential politics, vape pens, and the discursive politics of culture, their strong arguments earning them a bid to the state tournament. The California High School Speech Association State Tournament will be held on May 3-5 at California State University, Long Beach. Congratulations to all of our outstanding speakers!